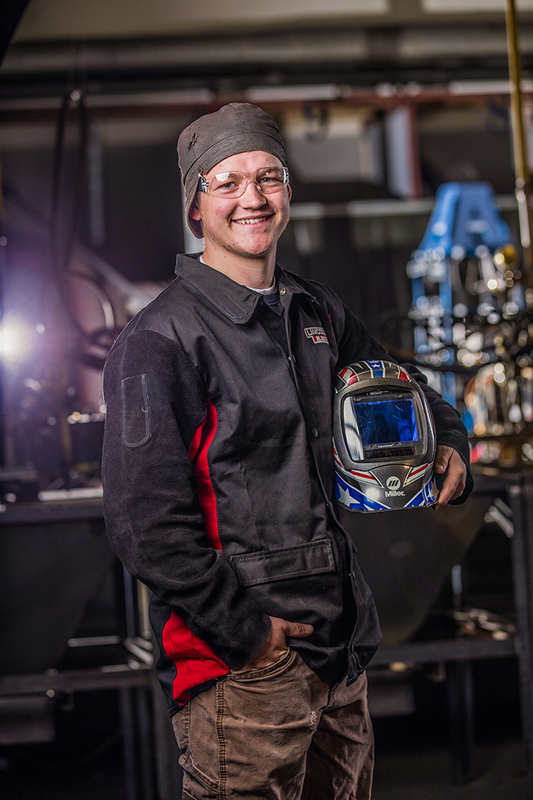 A USU Eastern welding student has done what no other welder in the 80-year history of the school has done before, nor any other Utah welding competitor for that matter. . . . Chandler Vincent was named the top welding competitor in the United States and the fifth best in the world. The jet-lagged 19 year old was back on the Utah State University Eastern campus a day after returning from his 17-hour flight. After competing in six categories on four-straight days at the 44th WorldSkills competition in Abu Dhabi of the United Arab Emirates, Vincent finished in 5th place and returned with a medallion of excellence. He was also awarded a medallion for “Best of Nation” during the closing ceremonies for scoring higher than any other USA competitor in their respective competitions. At the opening ceremonies, Vincent served as the U.S. flag bearer representing TeamUSA. With only 11 members, USA had the second smallest team at the competition. He was one of the 1,300 students from 59-WorldSkills- member countries and regions showcasing their talent across 51-skills competitions. This was the first time the competition was held in the Middle East and North Africa region. Throughout the week of competition he averaged five and a half hours of welding each day, but never felt stress. Vincent scored more points than he has ever scored in nearly every category. Out of the 800 points possible, there was a 9-point spread between first and 5th place. A student from China placed first, Korea second, Japan third, Taiwan fourth and the U.S. fifth. In Vincent’s hometown of Roosevelt, Utah, he is a rock star who everyone in the community knows. He is remembered at Union High School for the kid who only wanted to hunt, fish and stay outdoors. He detested school and every class he took. When he explained to his mother that he was dropping out of school, she begged him to go to school and take just one class he loved. At 15 years old, he registered for a welding class at the Uintah Basin Applied Technology Center and the rest is history. It’s been four years since that pivotal moment, and he is the best welder in the U.S. and fifth best in the world . . . quite an accomplishment for a guy who hated school. He said he’s not done with classes at USU Eastern until graduation in April 2018. In his final semester, he wants to learn more about the science and theory behind welding, take a machine shop class to help him with fabrication, plus an accounting class to help his business. He also wants to become a certified welding inspector by passing the 6-hour certification test. With his education and experience, he plans to reopen his welding business in May 2018, a business he put on hold after high school to attend USU Eastern. He’s received a number of job offers, but chooses to be his own boss and live where he can hunt and fish and be outdoors. In June, he traveled to Australia with two of his instructors to compete with other national welding competitors in preparation for the world competition. He has traveled to Lincoln Electric’s headquarters in Cleveland to work with their specialists. He was in Washington D.C. with other TeamUSA competitors and met with the Undersecretary of Education. Possibly his favorite practice sessions were in St. Louis Missouri with Ray Connolly, the TeamUSA welding expert and former WorldSkills gold medalist. What’s next for this talented 19 year old? He wants to give back to the welding community. “I’ve already volunteered to help train the US competitors for the next WorldSkills competition.” Russia hosts the next WorldSkills competition in two years, and Vincent plans to help make sure the U.S. welders prove they are the best on the world’s stage.